A visit to Baddesley Clinton near Warwick uncovers a gruesome box containing a wooden peg removed from a child's eye by a surgeon in the 1780s. Browse content similar to Baddesley Clinton 1. Check below for episodes and series from the same categories and more! In this idyllic setting, it feels as if we've stepped back in time. It's hard to believe we're only 15 miles from Birmingham. But it was in Tudor times that things got really interesting. earned himself the nickname The Antiquary. that the Antiques Roadshow has come to his home. Welcome to Baddesley Clinton in Warwickshire. and was very proud of his ancestry. fitting for a man of his stature. he couldn't get enough of it. There are heraldic carvings everywhere. he had made for the grand master bedroom. Can't say I blame him. Certainly rather impressive. for profit, or for pleasure. Sounds like a few of the antiques experts I know. to an ardently Catholic family. during the reign of the Protestant Elizabeth I was risky. a Roman Catholic priest in your house. But his tenants were undeterred. The priest hunters had arrived, and they wanted to search the house. to a well-concealed priest hole in the medieval sewer below. three were later executed for treason. he managed to escape any blame. until it was all handed over to the National Trust in 1980. I wonder which of them will be for profit or for pleasure? Let's join our experts and visitors and find out. So, this is quite a heavy pedestal. How on earth did you get it here? that carried it all the way in for us. That's fantastic. Well, thank you for bringing it in. Do you have any story about it? Do you know anything about it? that it was plaster or something like that. and he said, "Could we have it"? So I've looked after it. In a fashion. Yes, it was before skips! Well, OK. We've got to date this. Do you know anything about the house at all? -Do you remember the name of the house? I think we could find out possibly who made this. Have you any idea of what date it is? so we just called it Adam. You don't need me at all here, do you, at all? -It's exactly what it is. You're going to tell me how badly I've looked after it. Well, what have you done to it, then? -Have you had it stripped or something? So, what colour was it? It was a sort of dirty grey-green. Ah. You mean, it was the original Adam grey-green? The Adam grey-green from the late 18th century? I just assumed that it was Adam. -And you still had it stripped? -and he painted it blue and white. -Yes, I know, you didn't want to know. possibly one of a pair, originally. What I love about it is the quality of this pine. -It's beautiful. But look at this. -Well, I'm sure it's wood. But everybody kept telling me it was plaster. But when little pieces come off, it's wood. It is, isn't it? You can see it's clearly wood. But not pine. It's probably a lime wood, which is the best wood for carving. And just look at the detail of the ribbon, the flowers. And that's typical of Adam. The ram's head is so typical of Robert Adam, the architect. I always thought it ought to have a bust on it. I think lighting, I think for lighting. if you had it stripped from the original Adam green. and not keep telling me it was plaster. It's carved wood, very special. A minimum, I would say, of £5,000. Perhaps my daughter will appreciate it a little more now! they would have been deeply impressed. So, you're a vicar, and these are your saints. and just add to the beauty of the building. It's St Mary Magdalen's in Coventry. We're famously known as the church with the blue roof in the city. and brought them back to decorate the church for its worship. yet there's something about them being 18th and 17th century. with the toddler Jesus, from Germany. but that's what's in the church archives. Well, I would put it a little bit earlier. I would say it was late 16th, early 17th century. I think you're possibly right, southern German. Now, the one to the left of that, well, she's very different. that is so lost to us in many of them now. to be a good example of oak carving. and it's St Anne teaching Mary how to read. It's quite different from the one we've just seen. as the figure next to which it stands. St John with a lamb that's jumping up at him. It's like a cloud that's fused with a human being. And I would say that was late 17th, early 18th century. And a rather different image at the end. Who are we calling him? Is it St George? It is, it's St George killing a dragon. Ah, I see, he's wrestling with it. But how does he go down with the congregation? and worry a few of them. when it silhouetted against a window. And so what's the solution for that one? He's been relegated to the organ loft nowadays. Well, let's talk about some valuations, if we may. again, something that attracts the eye. And I've thought long and hard about the problematic St George. I'm beginning to wonder whether he could be much, much later. But I'm going to say only about £2,000 to £3,000 for this. somewhere in the region of about £50,000. I think it's going to cause me a bit of a heart attack now! to the time that it was made. A time when it was about discovery. and a little object like this catalogues it all. I don't know where he got hold of it. and I probably shrugged my shoulders and walked off. -and I want to know some more about it from you, please. -I'm going to be really pedantic and put on gloves. interferes with the coating over the globe. to use gloves, to stop anything happening. -You know, it's in remarkable condition. Nath Hill - Nathanial Hill - and the date, 1754. Well, Nathanial Hill was a globe maker. judging by the number that have survived. there were all kinds of stuff going on. -How closely have you looked at it over the years? so it isn't on the globe. and I'm just going to give myself a bit of an aid. Yeah, you see, this is... This is fantastic. It's the parts that explorers hadn't yet reached. and this was part of that education. and the Southern Hemisphere printed inside the cover of the globe. you would have discussed it with your friends. "Ah, I've got the 1754 one." "Well, what's happened since the last one was printed?" "Well, look, they've discovered another little bit of X, Y and Z." but also, they were educational amusements as well. between £7,000 and £9,000 on it. Shall I write it down? But it's slightly more interesting than that, isn't it? -it's engraved with an eye and an inscription. and, inside it, it contains a wooden peg. -by about a quarter of an inch thick. -and it's beautifully attached to the box on a little silver chain. not a surgeon as we would know today. and the date on it is actually 1781.
so it's quite difficult to see. and they agree that it is 1781. -I think it's just got a little rubbed. to have done an operation like that. So, how did you come to own it? Is it a family piece? It belonged to my late husband. in the back of a cupboard. and didn't discover what it was until it was cleaned. So we don't know any history about it really at all? We don't know any history at all. Well, I think it's a fantastically macabre little piece. Probably a little pillbox, dated from the 1780s. -it doesn't really have a great deal of value. it's something that would be really, really collectable. I would like to see it in a museum. And have you tried to research the name of the surgeon at all? that may be why I wasn't very successful. Obviously, we have to talk about value. something of that sort of order. I've ever seen on the Antiques Roadshow. What can you tell me about its history? for as long as I can remember, obviously. I believe from a country house sale not far from here. -which I think might have been in the Guinness family. I expect you might know also who might have made it? I know the top is Elkington. or then it was called electro-typing. and it produces the most perfect copy. and make it, aesthetically, a stunning object. -There's one thing I didn't say. -but I've got no way of proving that. All right, well, we'll come to that in a moment. Let's have a look at the decoration on the top here. We've got...astrological signs around the outside. and then we've got the scorpion for Scorpio on the edge. it looks like harvest time. The fruits of the earth sort of symbols. -I can tell you, no, it wasn't. on the 5th of October 1869.
but it's not for the Great Exhibition. You know, nearly 20 years too late. -Wonderful. Thank you very much. -I think I've found the coolest item today. OK. My friend Tony give it to me in about 1985. "I was working in a cinema, I found this in the attic." "you can have free beer for, like, two nights." -so it's stuck in the attic most times. -and, literally, to do what it said. It's a sign to say, "This is a talking film". cos it's worth £300 to £500. OK. You know, it's going to stop in the attic, unfortunately! So, look, "The world of fashions and continental feuilletons. "embellished with London and Parisian fashions." -and she had it when she was 15 from a family friend. -And she's kept it ever since in her wardrobe. Wrapped up nice and neatly. and I've had a look at it and I think it's fascinating. -so the colours really leap off the page. -I suspect that's something that appeals to you? -I love anything with colour. so it's definitely appealing to myself. It's incredibly opulent, isn't it? -Yeah, so quite an unexpected piece. nearly 200 years, it's just wonderful. and I think it may have lost a couple of pages, front and back. -It's not a big problem. People will always love colour, people will always like fashions. I wasn't expecting it to be quite that, worth quite that much. I thought all my birthdays had come at once. Doesn't add up. 1620? No! So it then clicked that this must have been a later voyage. from Plymouth to Plymouth Rock, Cape Cod, etc. and the cook was my grandfather, Walter Godfrey. I mean, was he a ship's cook normally? and that was his living. He was 57 when he sailed on the Mayflower II. Did they dress in modern clothes or contemporary clothes? and he can be seen here wearing the outfit. you know, ship's biscuits with weevils in. Did they have a modern menu? I think... No, they didn't have a modern menu. three meals a day for 33 men, 53 days. but the crew really appreciated the efforts he was making. -which is, of course, a great scurvy inhibitor. So I think the crew really appreciated his efforts. when he says "a rough sea", you can tell! is almost following the waves! And did you know your grandfather at all? I knew him till I was about six. He was a bit of a character. when they arrived in America, they were feted. Just tell me what's going on here. celebrating the close union between the two countries. you know, met the President, and they had a fantastic time. and it was a celebration of a union. And a true adventure, yeah. and ran round cleaning themselves. So, they had a good, fun trip. we're not talking about, you know, thousands of pounds. to donate it to a museum would be ideal. maybe between £600 and £800 for the whole archive. -But that's not the point, is it? of what was a daring and exciting voyage. Well, thank you so much for bringing it and sharing it with us. and this one's a blinder. and it's just stayed in the family ever since. that I don't doubt is from his dining table. Are we talking about a looter or...what? Erm...possibly he helped the King and maybe the King gave it to him. I see. That's what it was - he was a royal servant aged 16.
to bring it here to the Roadshow is magic. You know, it's history come alive. So, what are they going to make of this in Australia when they see it? I haven't actually told anyone I was bringing it over! You spirited it out of the country? It's only on eight times a day! So, I mean, it's a story piece, of course. cos if you don't get it back in one piece, you're mince. as to what it's used for. And Marc Allum, you've brought this along. I say "gruesome" because it is a bit. only one of which is right. Well, the first one is that this is a prototype prosthetic hand. crashed, and unfortunately lost his hand. Where would this go? Up his arm? and he could operate those parts to make the hand move. Now, the hand was interchangeable. This is just one of the hands. But this was the first of its type. -Well, just after the First World War. Right. So, a prosthetic hand. What else? and it became a bit of a problem on the roads. could operate the lever and the hand would go like that. -Or go like that, presumably. And would indicate that you were going in that direction. OK, so a hand indicator - literally - for a car. My final offer is, are you a member of the AA? -You used to be, OK.
between them and the people that were members of the AA. many of you will remember those chrome and yellow badges. and, as he came towards you, he would salute you. -Everyone knows about the AA salute. and it was getting dangerous. and this was made as the solution to that. people got their salute and the AA man carried on. So, what do we think, folks? You think it's the AA saluting hand? I think it's possible... I think I'll go for option three. You're going for AA saluting hand. I was going for two, but I'm going for three now. OK, well, this is what I think. As a prosthetic hand, it's a bit useless. -I'm not sure I buy that. ..you wouldn't just have one, would you? Cos you'd have to have two. -So we don't think that, do we? ..who remembers it, remembers the AA salute. That's what we think, isn't it? The AA salute. -£3 a year to join. £3 a year to join! -A princely sum. AA salute. Are we agreed? Apart from you, in the bowler hat. The AA salute, Mark. Do you know, I am just SO pleased. Really? Is it the prosthetic hand? I knew I would be good at Call My Bluff. It's the transport semaphore direction indicator. And it comes from the Coventry Motor Museum. I think it looks like a wholly unreliable object, I have to say. It's probably the reason it never really caught on. Well...you foxed all of us, didn't he? How has this come into your...? and it's passed down to me as I'm the oldest granddaughter. and, in actual fact, they had to escape the Gestapo. -And she managed to take her jewellery with her. and this is the one that remains. Oh. It all sounds quite dramatic, doesn't it? Escaping from the Gestapo and all that. But thank goodness that they had something portable. And she was a very stylish and sophisticated lady. -So this is one of the pieces she kept. It dates, actually, from the 1925-1930 period. which the 1920s Art Deco period was all about, colour and vibrancy. so this is a sort of crossover style, basically, between the two. and it's been a little bit knocked around in the mount. of the piece of jewellery, really, doesn't it? from that very traditional use of brilliant, round diamonds. going on with it, haven't we? -Did you know your grandmother? -Yes, I knew my grandmother. Do you remember her wearing it? Oh, yes, she wore it, and she was very stylish. Even in her 80s, she was always very elegant. Fantastic. Elegance is the key, really, isn't it? As far as value is concerned, I'm sure you're never going to sell it. -It goes to the grandaughter. fetching round about £2,500 to £3,500. it might fly a bit further. and then you arrived with this. and how did you come by it? at a Leicester antique fair. and I decided that it was nice and I bought it. -I know this is one of a pair. I don't think the car springs would've taken both of them. These must be displayed beautifully at home. -Where do you have them at home? -And they've been in the garage for how long? and that's where they've sat. What we do know about this is it's made, as I said, locally. How do we know it's Coalbrookdale? because, if we look here, we can see it's got stamped "Coal" and "dale"
because it's being blocked by that. What have we got there? About three or four feet. flanking the beautiful stepped entrance coming in. with this lovely fruit hanging down in the mouth. probably from around 1870, 1875, something like that. of between £2,000 to £3,000. And now you can tell us what you bought them for 45 years ago. -That's not a bad return on your money. Although, having said that, £47 was quite a lot of money. It was as much as I had at the time. That's the typical collector's story, "It's everything I had". but look at this wonderful pair of lanterns I brought home for you. Thank you very much for bringing them down. Lovely. This was made for a Mr Plumb. Are you are Mr Plumb? I am indeed a Mr Plumb. -So this has been in your family since 1842? -It has. It has indeed. And did you carry this all the way here today? It's the most magnificent jug. and just before you put it on the table, I had a look inside. -This has actually been cast in a mould. after the outside had dried? It would take, I don't know how many men - four, five men. So this was something quite special. -And it was made for an ancestor of yours. What did he do? Do we know? the birth of a son was much more important. It meant that the farm would survive. but the fact that the farm would continue. Have you seen how it's a bit rough and a bit mucky? Yes, I've seen it's a bit mucky. -Do you know why that is? That's because it had another name on it. -And that's been rubbed off with sandpaper. -possibly by the local coachbuilder or the sign writer. so it would've been second-hand, I suppose. I think you'd be celebrating to the tune of £3,000. Because where would you find another one? This is the Rolls-Royce, to go with your Rolls-Royce, of tea sets. Well, it's a travelling tea set. I believe it was made in the late 19th century. and bought it and brought it home, showed it to me. I was very impressed, I thought it was lovely. then you have the teapot. And the great thing is, it's crested. Have you done any research on the crest? but I've never had the pleasure of meeting. to have purchased something like this. This wasn't cheap. in this red, kid leather, or Morocco leather, case. It's just everything that you'd want. the most superlative collection of buttons that I've ever seen. Somebody must have spent a very long time building the collection. -and she'd carried on collecting for years and years. So, where did your mum collect them? Well, every weekend, my dad and her were off to fairs. I wonder, did she divulge to him what she was spending on this...? and then just ask for a little bit extra to buy that last piece. She obviously didn't have any particular style or era. Anything that appealed to her. This, I understand, is only a small part of the collection. -This is only a small part, yes. Let's talk about a few of them, because obviously we have so many. were these little Essex crystal buttons here. but they're also dogs, and people love dogs. -We wondered, we wondered which country. Had you ever considered these? we thought they must be gold. that have been cleverly cut and turned into a set of buttons. How amazing. We had no idea about that. -Ivory, with little silver backs on them. Gosh, you know, I'm lost for choice on words here. in probably the 1860s, 1870s. She must have been quite an authority on buttons. She was actually the co-founder of the Birmingham Button Society. and she was asked to do a little presentation of her buttons. Everybody came and asked questions. They were fascinated. -So that was a really big day. -It was a nice legacy for her. there's a huge amount of interest in European buttons. they would probably be £400 to £500. -Gosh, that's just for a pair! it's rather unquantifiable, to be honest with you. and more than likely more than that. -Gosh. Thank you very much. It's lovely. It's so beautiful to see them all displayed. I've never seen them displayed like this. It's truly beautiful. It's a lovely legacy for your mother. Yes, just looking at it today, it looks beautiful for us. and I was really interested in it. which sort of made it a bit special as well. With the ringlets down and that, she'd got such a pretty face. you'd have them tucked away. or they'd hide them away under the lid of a snuffbox. Women would wear them in a far more open way. who were, on the whole, far more secretive. So, what about the artist? Where did your research go after that? to check the artist out. and it had got 1835 on it. And it had got RA after it, and that was Royal Academy. that's how he would inscribed the reverse of his works. and he really became one of the most important artists of that period. we should also probably look at what's on the top of it. it could be to celebrate their death. to record the likeness of a lost loved one. It's very personal with miniatures. You don't really have this as much in the larger oil paintings. anywhere between £3,000 and £5,000. Before we really closely examine it, tell me what you know about it. by my Aunt Minnie and Uncle Barney on my wedding. They bought it at an exhibition at Watches Of Switzerland. to any jacket that you wore it on. which makes it more wearable. -We know that it's made of yellow gold and white gold. -We also know that it's in the shape of a Beefeater. and it shows the watch. but it's upside down, so you read it like a pendant. -Don't you think that's the best thing? I think it's just really cool. and the jewellery department have not seen the like before either. and it's a moated house, and here we are with the drawbridge. -Don't you think that's just great? -I think it's a beautiful piece. -Does everybody like it here? For me it dates in the 1960s, possibly 1970s. When, can I ask, were you...? and I know my aunt had had it some time before that. She'd had it for quite a while, I don't how long. But, obviously, it's got London written all over it. because it's a lovely piece of jewellery which is integral. but they're only tiny stones, they don't really add to the value. and the fun of it. Fashionable? I don't know whether it's fashionable. -Do you think it's fashionable? -You either love it or you hate it. If you love it, you're going to want it. probably between £2,000 and £3,000. Right, lovely. Thank you very much. of a 12-metre racing yacht. I don't think I've ever seen such a beautiful model. before I go into the history of it and things. when he was president of the club in 1937. Now, I know that name, Coats. That's Coats Textiles and Cotton. So wealthy that he never had to work in his life. and he became a yacht designer. which were built by Mylnes, up in Scotland. which is in this photograph here. I can see it flying the waves there. which is engraved into the top of the sail here. One of the most amazing things about this yacht is it's SILVER! but I have picked it up, and it's very, very heavy. There's a lot of silver in it. And I can also see... I looked at it earlier. It's actually hallmarked along the front here for 1935. -It's a little bit later than its '26 building. I think what I really, really love about it is the detail. is that it evokes a place in yachting history, doesn't it? and these beautiful, sleek yachts were just part of that world. Something to a certain extent that's really disappeared now. to build yachts like this and run them. You say he had several designed and actually had several built. I think this is an absolutely beautiful thing. because there's a lot of history imbued in this. £5,000 to £8,000 at auction. and we will look after it very carefully. but worth just a few pounds. But maybe it's more special than that. who was a bodyguard to Lord Mountbatten. and he gave it to him after many years of service. and I think that was his way of showing his gratitude. "With gratitude from Lord Mountbatten". Well, that is a story, isn't it? and I had no idea that he also painted. And this is of the castle and Mullaghmore. so he would have gone there to relax during the summer with the family. so he wasn't there at the time. I think it's a charming picture. And with the story associated with it, it comes to life, doesn't it? so a lot of story there, a lot of emotion. because I think it adds to the story and it adds to the value. of, well, certainly between £600 and £1,000. Diamonds sparkling in the sunshine here. This is almost Hollywood sunshine, isn't it? It is indeed, and that's exactly where this was bought. Wonderful. Tell me every part of how you got it. We were introduced to her. I knew her, then, until she passed away, for about 24 years. In fact, we used to go and stay with them in Miami. -It's always nice to have a jeweller as a friend. and also...probably a better investment than the bank. all these cliches are tumbling out. But, in fact, it had belonged to Rita Hayworth. How marvellous. That's very good to know. who was the son of the Aga Khan. but tell us a bit more about this wonderful star. Well, she was an amazing star and she was a real Hollywood A-lister. Glenn Ford, Frank Sinatra, Orson Welles. She was in Only Angels Have Wings. -who didn't need the diamonds, but she had them anyway. But this is '40s, American, fabulous Hollywood glitz. but I can't find her wearing it! -and maybe even her will would be interesting too. but it's not only an investment cos you love it, don't you? and I haven't made any calculations. -Do you? Come on, then, how many carats? Roughly, they haven't been pulled away. -There's nothing rough about this. That was really quite a buy. it might be only a mere £45,000. It's still lovely! I'm delighted. ever did belong to Rita Hayworth. the difference in price, I guess, that's the value of celebrity. 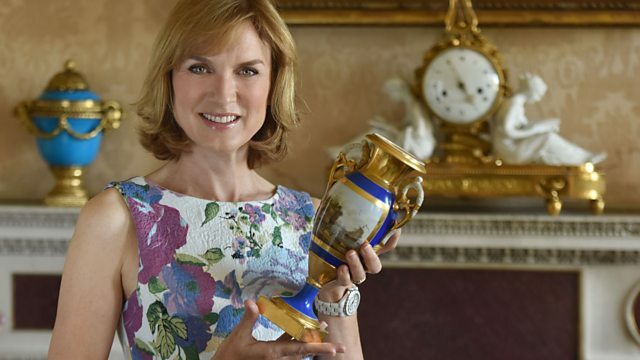 From the Antiques Roadshow, until next time, bye-bye. Fiona Bruce and the team visit the moated manor house of Baddesley Clinton, just 15 miles from the bustle of Birmingham. A busy day of valuations uncovers more fascinating finds, including a gruesome box containing a long wooden peg removed from a child's eye by a surgeon in the 1780s, a glittering diamond bracelet once worn by Hollywood star Rita Hayworth and a painting made by Lord Mountbatten of his family home. There's also much conversation about a carving of St George banished to the organ loft for offending parishioners, and a visitor gets a stern warning from a Roadshow expert after stripping a rare wooden pedestal of its original paintwork.